Historically, our geographical situation and lack of raw materials forced us to look beyond our own borders for industry and employment. We turned our hands to trade and became home to many trading houses and mercantile companies. Amongst which is The East India Trading Company whose lucrative trade in spices and herbs were to become the main source of the Netherlands’ Golden Age halfway through the 17th and 18th centuries. Widely distributed cable networks were laid in the 70s, providing us with unsurpassed connectivity and a platform from which we could welcome new ventures from a plethora of home-grown and international firms. The liberal and creative eco - system in Amsterdam no doubt further fed the success of many well-known digital companies such as Lost Boys, Layar, Coosto, Mediamonks and bol.com that flourished on the foundation of the high-speed telecommunications networks. 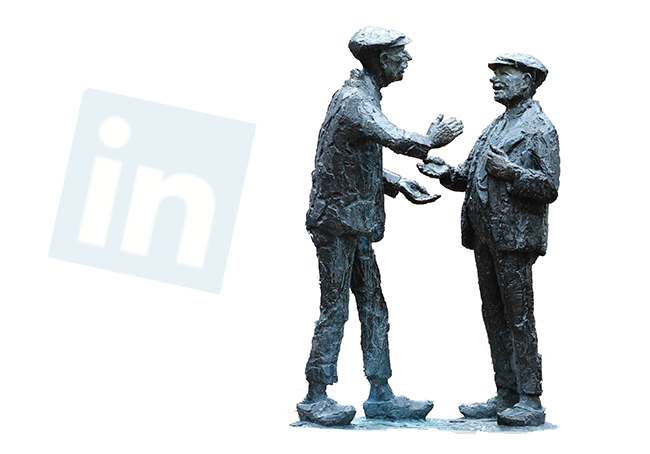 The Netherlands is one of the most active countries on LinkedIn with an average of well over 500,000 daily users. While finding a new job is still a valuable part of a LinkedIn membership, the most popular activities on LinkedIn in the Netherlands are (1) networking, (2) building a professional reputation and (3) the identification of new business opportunities. This goes to show that the Dutch have fully grasped the potential of LinkedIn as a platform for business opportunities. The entrepreneurs, managers, salespeople, directors and executives with whom I speak daily, are sharing many anecdotes about how they successfully do business and actively develop relationships with relevant people on LinkedIn. Many indicate that by means of an introduction through a common connection and a good use of InMail best practices (keep it short, relevant and personal) they can often get in touch with relevant decision makers via LinkedIn who would otherwise ignore them. Others actively develop a reputation for their products or services by regularly posting fascinating updates. But the best example of successful business on LinkedIn probably comes from the industrial designer of an innovative lighting concept for athletes. For months she approached several retailers with her concept to no avail, until she discovered on LinkedIn that the brother-in-law of a friend had a leading position in a top sports brand. The appointment was quickly made and her product eventually formed the core of a new line of running clothes for this brand, successfully launching her reputation in the process. I’m happy to see the trading blood and passion of the Dutch seafarers is flowing faster than ever in the digital age. Partly because of an enthusiastic adoption of new ideas and technologies, the Dutch actively use the commercial potential of LinkedIn and have embraced this as a natural aspect of their commercial activities. They help to establish the Netherlands as one of the most innovative digital economies in Europe and over the next few years we can therefore expect many new digital success stories from the Dutch soil. I’d love to hear from anyone reading this blog post what great ideas are already taking root. Sales Managers, Are You Using These Metrics to Measure Social Selling Performance?